Little is known about Hugh Finlay, other than he was a member of the Art Society of New South Wales and exhibited in its first exhibition at the Garden Palace in Sydney in 1880. Fifty watercolours by Finlay, mainly of Australian subjects, were shown in London's Haymarket at Thomas McLean's Gallery in the 1880s. According to the catalogue, Finlay spent six years in Australia, travelling in New South Wales and Victoria. The watercolours have transcriptions from old labels written on their versos, noting the subject of each as Yarra Flats from Christmas Hill, Victoria. These transcriptions also state that the Yarra Flats was in Evelyn County or Burgoyne, 31 miles (50km) east of Melbourne on the Yarra Yarra River and that in 1865 Christmas Hill Station was occupied by J Wilson and comprised 16,000 acres (6475 hectares) with grazing for 960 head of cattle. 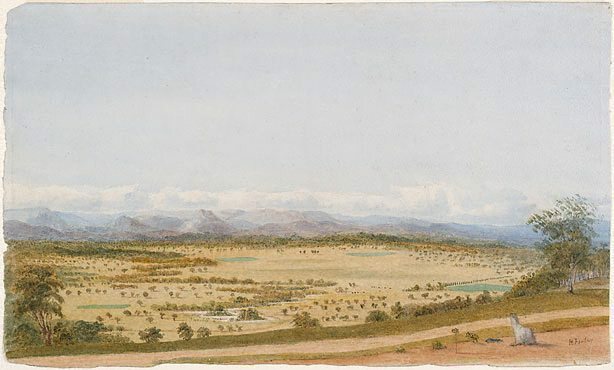 Eugene von Guérard's 'Lilydale from the Christmas Hills' is from a similar vantage point as this watercolour. Signed l.r. corner, brown watercolour "H. Finlay". Not dated. Hendrik Kolenberg, 19th century Australian watercolours, drawing and pastels from the Gallery's collection , 'Introduction', pg. 6-16, Sydney, 2005, 10, 67 (colour illus. ).